Authorities have arrested an accused ISIS supporter who allegedly planned to commit an armed attack at a bar in Rochester on New Year's Eve on behalf of the terror group, officials said Thursday. Emanuel Lutchman, 25, of Rochester, has been charged with attempt to provide material support and resources to ISIS. Rochester Mayor Lovely A. Warren said Thursday that a New Year's Eve fireworks show had been canceled so that more officers could be deployed throughout the city. She said that there was no new credible threat, but that canceling the show would help police focus their resources elsewhere. A celebration at the city's convention center was still planned, she said. "We all must acknowledge that in today’s day and age any place in the world can be a target," Warren said. According to a criminal complaint, Lutchman began corresponding with an FBI informant in November and made numerous statements expressing his support for ISIS and his desire to join the group in Syria. Late this month, he allegedly told the informant he had been in contact with someone who identified himself as an ISIS member in Syria, and that he relayed his personal "hatred for everything in America" and his intention to join the group overseas, according to the complaint. Since Lutchman apparently had no one to vouch for him with the group, the alleged terror operator with whom he was communicating told him he would have to prove himself, according to the complaint. 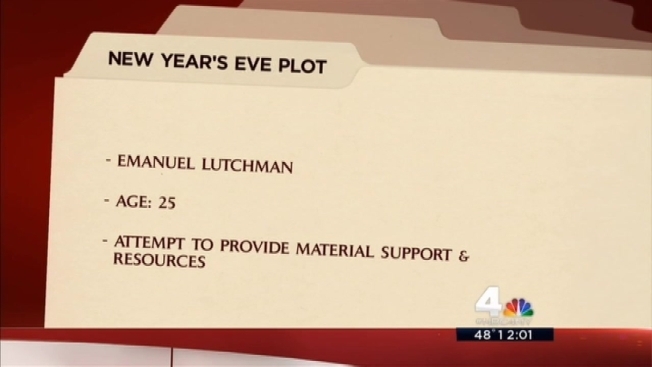 Court documents say the overseas individual told Lutchman to plan an operation on New Year's Eve and to kill as many Americans as possible, then he would help him get to Syria. When Lutchman allegedly said he hates it in the United States and was ready to "give everything up" to join ISIS abroad, the overseas individual told him, "For now do what you can over there." Lutchman met with another FBI informant he assumed was a supporter on Monday and indicated he wanted to target a club or bar, suggesting he could sneak a bomb inside the facility, according to court documents. The complaint says Lutchman also said they should kidnap a couple of people and kill them. He said they should wear masks to avoid being identified by law enforcement officials. At one point during the meeting, they drove by the restaurant in Rochester and Lutchman identified it as a potential target, according to court documents. He said he didn't have funds for weaponry, but said they could use knives for the attack, noting he knew someone with a machete and his wife had a dagger, according to the criminal complaint. The next day, he called another one of his "brothers," another FBI informant, and said they needed to get gloves, masks and zip ties in the event they kidnapped someone, court documents say. On Tuesday, Lutchman and an FBI informant went to a Walmart store in Rochester to buy supplies for the operation, according to the complaint. While there, they bought ski masks, zip ties, knives, a machete, duct tape, ammonia and latex gloves, the complaint alleges. Then Lutchman allegedly said, "It's going to get real after this. It's just you, me and the Lord. We gotta do this, we gotta do this precise. If we grab somebody, they can't live. They may identify the vehicle. They can't live." Lutchman and the informant also talked about making a video before the operation in which they would explain their reasons for the attack and swear allegiance to ISIS, according to the complaint. Lutchman said he planned to release the video after the operation, court documents say. Lutchman was arrested Wednesday. Prior to his arrest, he had made a video, recorded on his cellphone by one of the FBI informants, in which he swore allegiance to ISIS and its leader and claimed responsibility for the planned attack in Rochester, according to the criminal complaint. Lutchman is a self-professed Muslim convert with a criminal history dating back to about 2006 that includes a New York state conviction for second-degree robbery. He served five years for that crime. Gov. Cuomo said Lutchman allegedly became radicalized while serving time in Attica. Steven Slawinski, his federal defender, declined to comment on the charges. Cuomo praised federal agents for the arrest and urged all citizens to remain diligent, adding that New York is no stranger "to these types of incidents." "The arrest of Emanuel Lutchman is an important reminder of the new normal of global terrorism" Cuomo said in a statement. "Today law enforcement did their job well – but the challenges we face have never been greater, and it is incumbent on every citizen to be diligent and responsible." Authorities have said there is no credible terror threat to New York City or other locales throughout the tri-state area this New Year's Eve. Thousands of uniformed and undercover officers will flood the area near Times Square ahead of the ball drop to ensure the safety of the million revelers expected to attend.